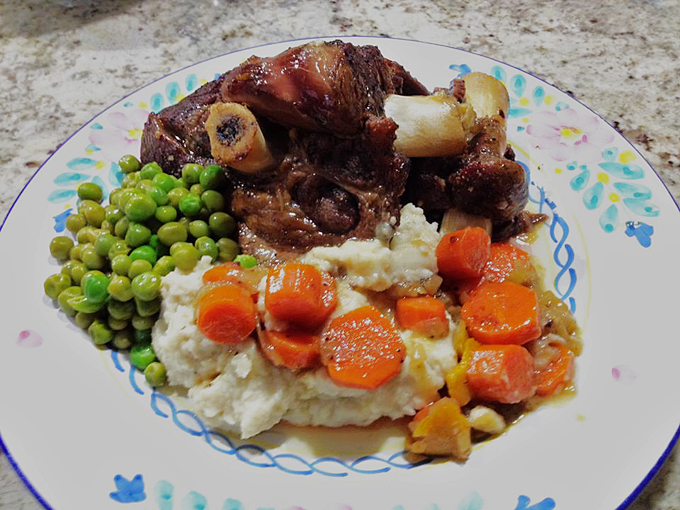 One of Phil’s favorite dishes is a nice, melt-in-your-mouth lamb shank. When we go out for dinner, if the restaurant offers lamb shanks, chances are he will order it. Lamb can be a bit tricky to cook at home. It’s usually not very cheap, so the pressure not to ruin it goes up a couple of notches. Our grocery store sometimes has lamb shanks on sale, but I usually stay away from them. Not this time. The price was too good to resist, and I decided to face the challenge. Brought them home without any specific recipe in mind, which proves I was in full daring mood. A quick search on the net pointed me to this simple and straightforward method from Fine Cooking, that gave me the opportunity to practice the “papillote” thing. It also gave me the opportunity to drive all the way back to the grocery store to get leeks (sigh). To offset the richness of the meat, I served it with a super light side dish, mashed cauliflower and celery root. Honestly, I think the puree might have stolen the show, it was superb! Arrange four 16×16-inch squares of heavy-duty aluminum foil on a work surface. Put one-quarter of the leeks, one-quarter of the carrots, 1 rosemary sprig, and 1 strip of orange zest on each square. Season each with a pinch of crushed red pepper flakes, salt, and pepper. Set aside. Pat the lamb shanks dry and season generously with salt and pepper. Heat the oil in a large skillet over medium heat until shimmering hot. Working in batches if necessary to avoid crowding, brown the shanks on all sides, about 10 minutes total per batch. Transfer 1 shank to each foil square, arranging it on top of the vegetables. Draw up the edges of the foil to capture any juice, but don’t seal the packets yet. Return the skillet to medium heat, add the vermouth, and bring to a simmer, scraping the skillet with a wooden spoon. Remove from the heat. Portion the vermouth evenly among the 4 packets, pouring it over the lamb. Dot each shank with a slice of the butter. Fold the foil to form rectangular packets, sealing the seams tightly. Arrange the packets on a baking sheet; it’s fine if they touch but they shouldn’t overlap. Bake for 3 hours; then check for doneness by carefully opening one of the packets (watch out for the steam) and testing the meat with a fork—it should be tender and pulling away from the bone. If necessary, continue to bake for another 10 minutes and check again. Transfer the contents of the packets to large plates or pasta bowls, surrounding the shanks with the vegetables and juice. Remove the rosemary and orange zest before serving. Steam cauliflower florets until very tender. Coat the celeriac chunks and shallot slices with olive oil in a large bowl, season with salt and pepper. Roast until tender and with a light browning around the edges, 25 to 30 minutes, moving pieces around. When the celeriac is easily pierced with a fork, transfer the pieces to a pan, add the steamed cauliflower florets, and start mashing it all with a potato masher, or use an immersion blender, depending on the texture you like.Turn the burner to low heat, add a dash of nutmeg, and add enough coconut milk to give it a nice creamy feel. Mix well and cook on low heat for a couple of minutes. Taste and adjust seasoning. You can also use the food processor to make the puree, if you like a much smoother texture. 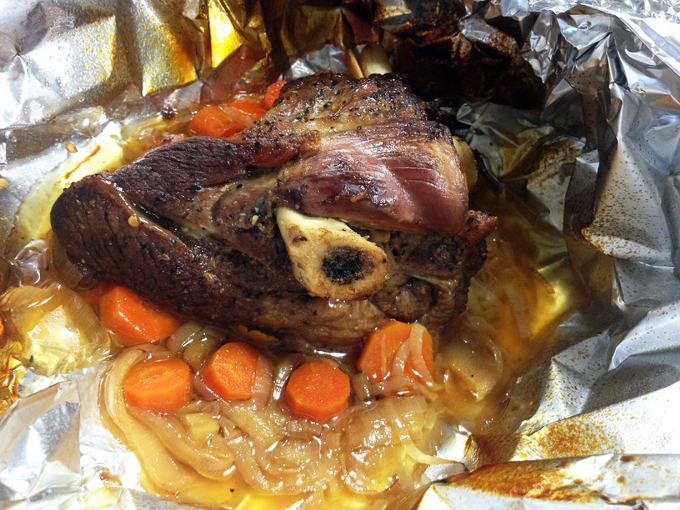 Comments: The most important step in this recipe is taking the time to brown the lamb shanks. I halved the recipe, since it was just for the two of us, but decided to post the recipe as published in the magazine which feeds four. I confess that I forgot to add the butter on top of the shanks when closing the packages, but that did not seem to hurt anything. Make sure you have a very big aluminum foil because it is important that the package closes well around the meat. Also, the recipe called for a cooking time of 2 to 2.5 hours, but I really like the lamb falling off the bone so I did not even bother checking it before 3 hours. Do what suits your taste best. The mashed cauliflower & celeriac was simply amazing! If you’ve been following the Bewitching Kitchen for a while, you know I love to play with cauliflower in all sorts of recipes, and you’ll find many versions of mashed cauliflower in the blog. This is a new favorite. If you serve it for guests, it will be pretty hard for them to figure out the components, but even if a little puzzled, they’ll be in love with it. 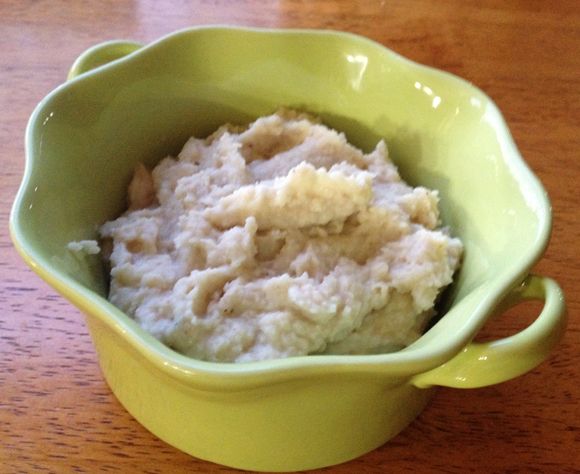 Some recipe sources advise to pass celeriac puree through a fine sieve to improve texture, but I didn’t, and it was still very smooth and pleasant. Of all jobs in the kitchen, passing things through a sieve is the one I despise the most, and always find excuses to skip it. My number one excuse is “I do not want to do it“. This meal would be great for company, since you can assemble the packages and start roasting the meat 3 hours before you plan to serve dinner. The mashed cauliflower can also be reheated without compromising flavor or texture. One of the wonderful things about papillote cooking is the aroma that is released once you open the package, it will certainly awe any guests! ONE YEAR AGO: Chestnut Brownies and a Blog Award!